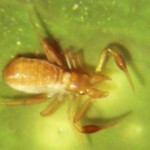 The glossy species has pedipalps, chelicerae and cephalothorax that are often dark, olive-green (smoky), which makes this species fairly easy to identify in the field; the legs are paler and pinkish in colour; length of body: 1.5–2.3 mm. Europe: S. from France, Corsica to Sardinia; E. to Bulgaria. 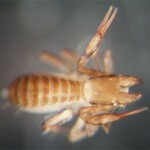 In Britain this species is widespread in the south of England and Wales, south of a line from Aberystwyth to Lowestoft. Where it occurs C tenuis is locally abundant and can be found amongst dead leaves and humus, under stones and appears to have some preference towards well-drained habitats on chalk, sands and sandstone. Chthonius tenuis – note dark palps characteristic of this species. Chthonius tenuis, wet preserved specimen.